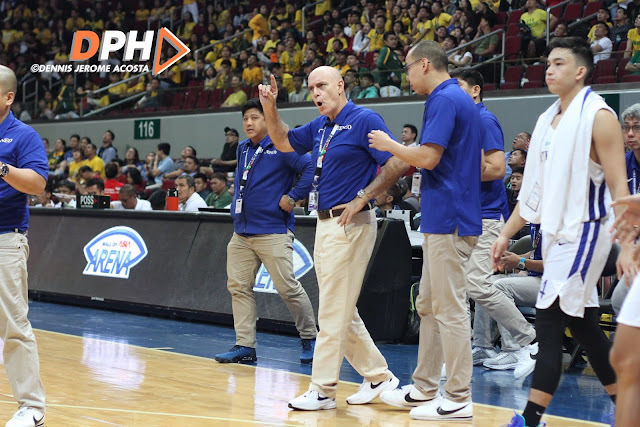 Tab Baldwin on Ateneo's loss against FEU: "We just didn't hit shots"
 Home  Ateneo Blue Eagles  basketball  college sports  Tab Baldwin  UAAP  Tab Baldwin on Ateneo's loss against FEU: "We just didn't hit shots"
PASAY CITY - The Ateneo Blue Eagles suffered a loss in the hands of the FEU Tamaraws during their last game for the first round of the UAAP season - and boy, was it tough. The Blue Eagles had a taste of the Tamaraws' full potential on Wednesday as they got pinned down with a come-from-behind attack that left them at the wrong side of the 60-63 result. The Tamaraws successfully broke the Eagles' five-game winning streak the same way they threw away the chances of the Adamson Soaring Falcons, the only other team which had beaten the Blue Eagles this season, for a sweep. The Blue Eagles' struggle to score a basket especially in the last quarter definitely did not escape the eyes of their own coach, Tab Baldwin, and he noted the one factor that gave the Tamaraws the upper hand for the game. "FEU played great defense, played a better game," Baldwin admitted, giving due credit to the Tamaraws' impeccable defense and immense determination to hand the season's current second-placer a rather disappointing loss. "They’re not as highly rated defensively as they are for nothing. They have one of the best defenses in the UAAP. Today, their defense was the winner and we were the loser," he added. "Tonight we just weren’t good enough. We just didn’t hit shots. We get 74 shots and they did what – 51? We shoot 17 free throws to their 11? We had ample opportunities. We just didn’t get it done," Baldwin said, counting all the what-could-have-beens for the Blue Eagles during the game. True enough, the game against the Tamaraws marked the Eagles' lowest scoring output since Season 79 as well as limiting them to only 38 rebounds and 16% three-point field goal. The Eagles also only produced 22 bench points and 21 perimeter points thanks to the Tamaraws' stifling defense. However, Baldwin played it cool by expressing how they're not here to dwell on their loss against the Tamaraws - especially not after they had exerted all their effort to take over the game. "I don’t think you can play a game and force 27 turnovers and get 19 offensive rebounds and feel bad about your effort. So, we feel good about our effort. We just didn’t hit shots. We have days like that," he said - and we couldn't agree more. After all, that's what basketball is - there are times when you win some, and there are times when you lose some.